Our unique heart design photo coasters will add the perfect finishing touch to your special day. 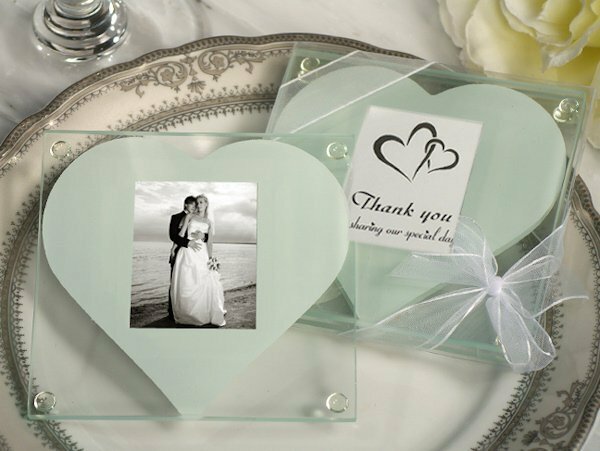 Packaged in sets of 2, each square glass coaster has an elegant white heart decal that holds a precious memory in the center. Coasters measure 3.5" squared and hold a 1.5" x 2" photo. Set is packaged in a clear pvc gift box with a white organza ribbon and a removable message of thanks in the center of the coaster. What lovely guest favors for wedding receptions! Do they come in sets of 2's? I'm a little confused. Yes, the Heart Design Glass Photo Coaster Favors are sold in sets of 2 and each square glass coaster has an elegant white heart decal that holds a precious memory in the center. Do we send the picture to your site and you insert them or do we have to do that ourselves? You need to manually insert the photo when you receive these Heart Design Glass Photo Coaster Favors. How do we add the picture and information for the bride and groom? Once received, there's a slot on the back of the coasters that you can use to slip a 1.5" x 2" photo/card in to. could the color of the heart inside the Heart Design Glass Photo Coaster Favors inside be changed? Unfortunately they cannot be changed. The inserts, however, can be changed. Do I provide the picture and you size it to the 1.5 X 2 photo? You need to manually put the photo that you like when you receive this Heart Design Glass Photo Coaster Favor. You have to make sure that the size of the photo is 1.5" x 2" . I am interested in the Heart design photo coaster favor. I have planned to give away for 150 guests but I am on a tight budget. Is there a sale on items that resembles that? We've already discounted all items 20-40% below retail. You can sign up for our newsletter and receive our promotional discounts that are located on our home page (located 3/4 to the bottom of the page in a green banner).